At first, NASA confirmed water had been found on Mars, a few months ago they found oxygen atoms in the Martian atmosphere by airborne SOFIA telescope, which operates aboard a plane. Dana Backman, director of SOFIA's outreach programs, told Space.com that the discovery of oxygen on Mars was a key piece of the puzzle and moves a step closer to finding alien life on Mars. Until now NASA deny that there is any form of life on the planet, labeling it as natural rock formations resulting from erosion by water and time, but remember previously they also said there was no water and oxygen on Mars – so is it possible NASA’s next step is to confirm that there is much diversity of animal life represented on the surface of the planet Mars? There is already evidence that Mars is inhabited by animal species that are like those that exist on Earth in this age, that once existed on Earth in prehistoric times, or that are hybrids that possess the characteristics of two or more Earth species at once. 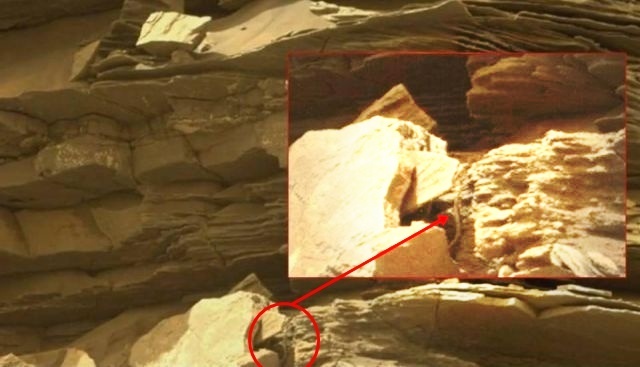 In the latest image taken by Curiosity appears a snake or worm that slithers on a rock formation.